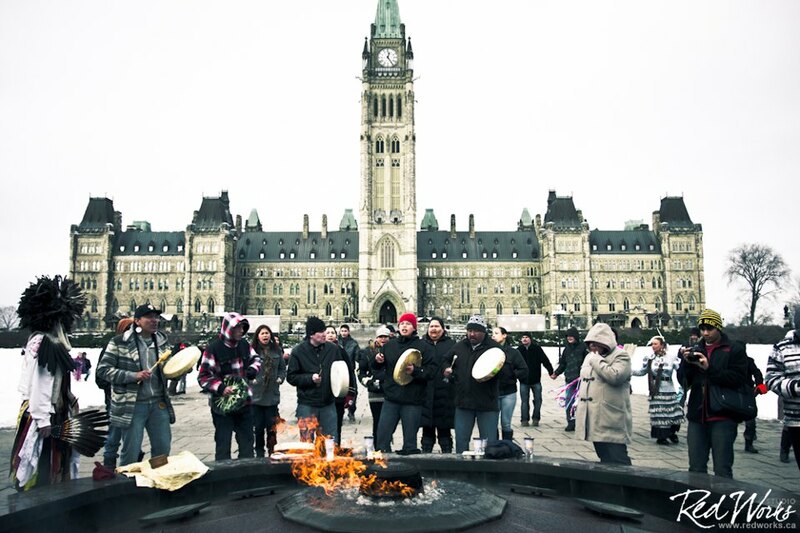 The ongoing Idle No More (INM) protest movement has brought flash mob round dances to streets, shopping malls and public spaces across Canada over the past couple of months. The protest movement led by First Nations in response to the Harper government’s Bill C-45 has garnered the support of many artists including Santee Smith, artistic director of Kaha:wi Dance Theatre. "The flash mob round dances we are seeing as a part of INM comes from Powwow Intertribal, meaning all Nations are welcomed and encouraged to dance," says Smith who is actively involved in the INM movement. 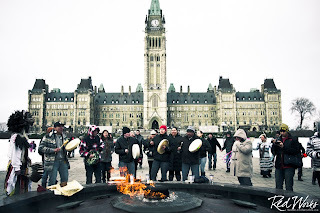 “For me the round dance represents a kinetic and spiritual commitment to unity and harmony. To dance you must commit to the energy of the circle, make contact by holding hands, witness others around the circle, unify to the heartbeat pulse of the drum and power of the song. It makes sense at this time of Indigenous awakening and resurgence that the round dances have become a significance part of the movement.” Hundreds of musicians, writers, theatre artists and dancers have signed the Canadian Artists Statement of Solidarity written by Winnipeg musician John K Samson calling for "healthy, just, equitable, and sustainable communities."